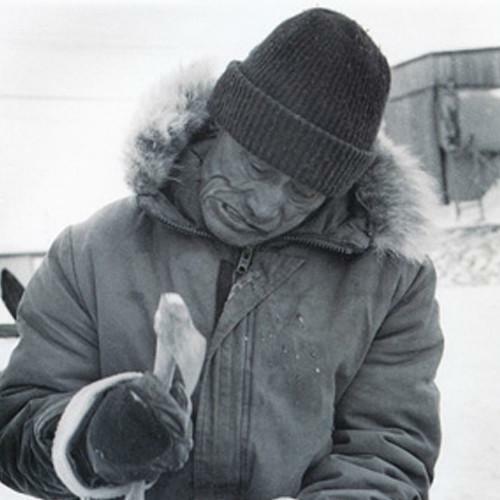 Barnabus Arnasungaaq was born near Baker Lake in 1924. He and his family lived a nomadic lifestyle for much of the beginning of his life. With the caribou herd and resulting famine in 1957, many nomadic Inuit were encouraged to move into existing villages. Sculpture was introduced to the area of Baker Lake in the 1960’s to help economic opportunity for this quickly expanding community. Barnabus has been a major contributor to the development and expansion of sculpture from this region for nearly four generations. A pioneer for art and especially sculpture in this region, Barnabus’s signature style has become synonymous with art from the Keewatin region. Using the dark matte basalt stone from the region, Barnabus’ work is stoic and enduring. He uses minimal detailing to allow his subject matter to speak for itself, favoring themes of men, women and some animals. As one of the eldest of the original group of carvers in his area, Barnabus has continued to use small hand tools for his carvings, giving each piece a distinctive personality. Barnabus’s sculptures have monumental presence, and are coveted by private and public collections worldwide.